I knew I wasn't a fool for thinking the color matters! "Insulation for crimp terminals comes in several forms. 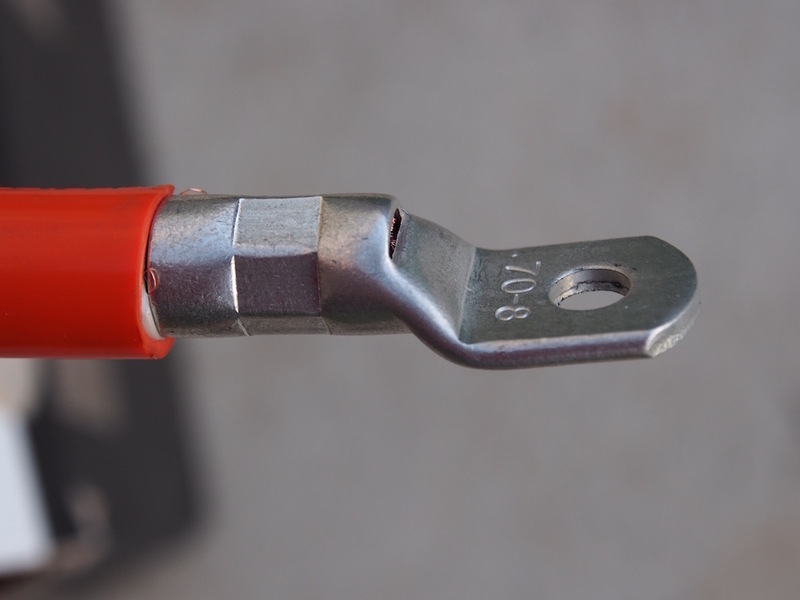 Low-quality, low-cost connectors typically rely on PVC insulation sleeves that are brittle and often crack when crimped; while all connectors are color-coded red, blue, or yellow to denote their matching wire size, connectors with PVC insulation sleeves use an opaque pigment." For 3mm wire I used to crimp or solder depending on my circumstances. Many years ago I got good crimpers and terminals and never looked back. It is hard to solder 3mm terminals up side down under a dash board or in a boat bilge without getting burnt by dropping solder. soldering is not fool proof...….skill is needed and I find the odd dry solder joint or a joint in which the flux is not completely removed causing the soldered joint to fail with time. As a forklift mechanic for 30 years and working on electric ones for the same length of time, I for most of it soldered the large power cables in these vehicles. The main reason was one of cost......the bosses I worked for were to lousy to buy good gear and solder joints worked OK if done correctly. 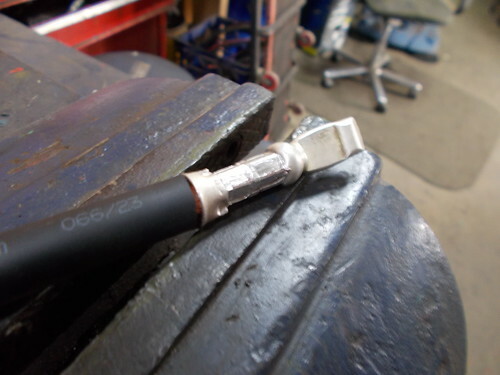 Recently the cost of good crimping tools for battery and large power cables has greatly reduced. For battery cables , hydraulic crimpers are much better and the cost of a hydraulic crimper with a good set of magnetic dies covering the full range of power cables found in automotive use is under $100 dollars . 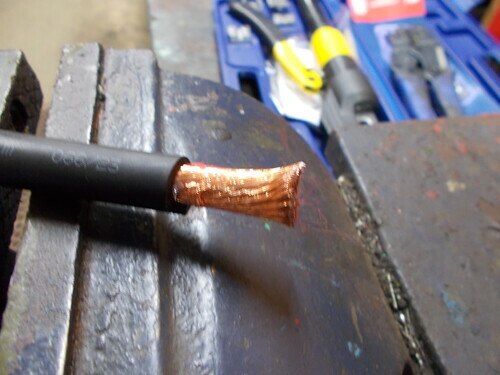 soldering battery cables in a boat hull, if petrol powered means a heating flame and a risk of petrol vapour flash over and the same with many work sites and hydrogen venting in vehicle battery compartments. 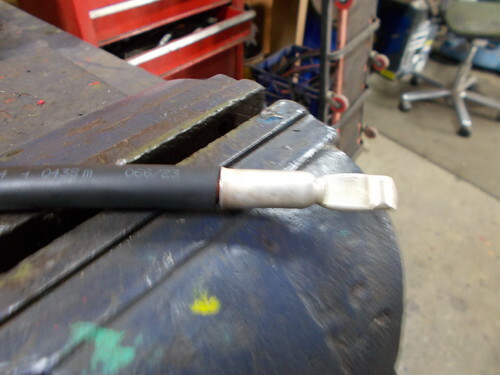 A soldered battery cable works well if done correctly, but if say a starter motor on a car has been given a hard time by cranking a non starting internal combustion motor until the starter motor gets hot...the wires will get hot too and the solder can melt or partly melt out of the battery cable joints. This is especially true for electric vehicles...…...like a hired out golf buggie, as the operators will not recharge it until it physically will not go any more because human nature is too lazy to recharge a hired electric vehicle. As voltage drops, current increasing to do the same work and wiring greatly heats up. 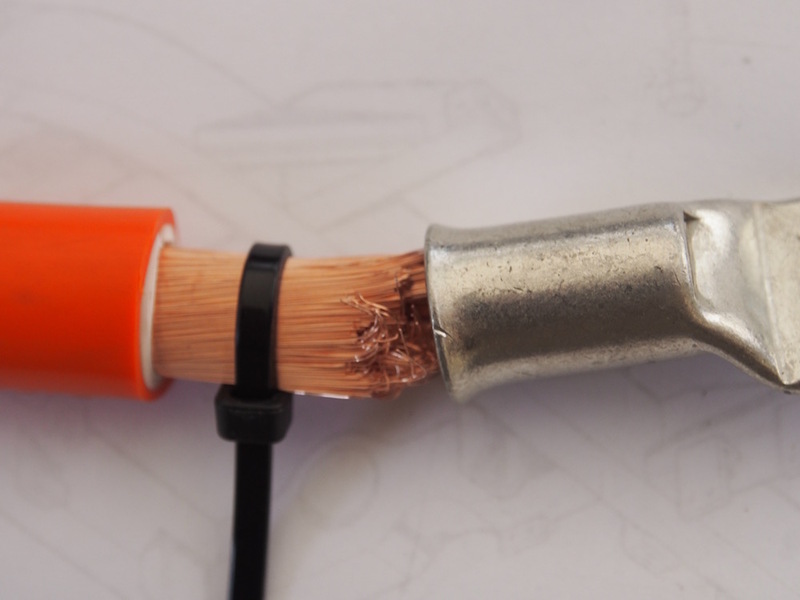 A crimped battery/power cable can get very hot , time and time again and not fail. Hydraulic crimping is not really crimping, but is fusion welding. Today I put my money where my mouth is. 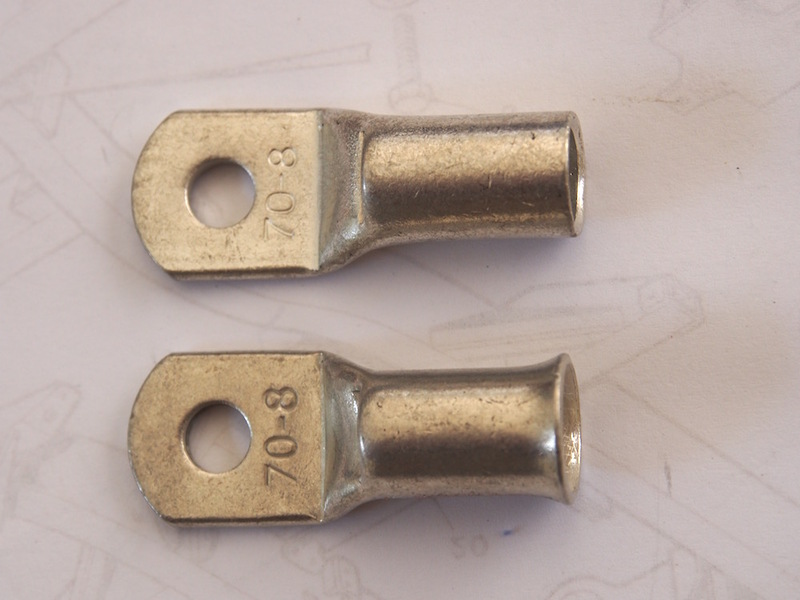 The sample in the pictures is a 175 amp Anderson plug cable lug....often used to connect winches and jump start cables to vehicles. The cable is a good quality fine strand battery cable of the correct size for the Anderson plug lug. The picture below shows the crimped joint which I have crimped a bit harder than normal. This picture below shows the crimped joint cut in half and cleaned up a little bit. 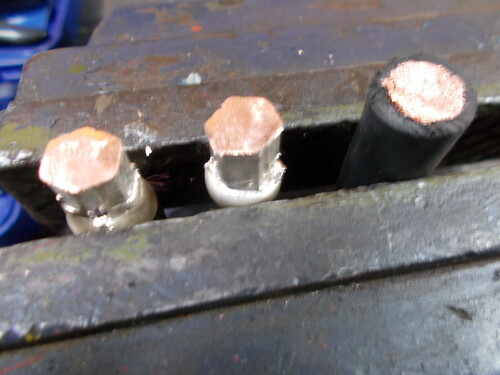 Note total fusion of the copper, the joint is no longer present, the Anderson lug and the strands of the copper cable are as one piece of copper.....the copper has flowed and fused as one.....no difference in the cross section can be seen. Also note the cross section width overall even with the lug over the out side of the cable is smaller than what the cable was before crimping. This joint will take extreme high current and over heat without failing.....the limit will be the insulation melting off the cable. I started out many years ago soldering because that was the way it was done and cost. 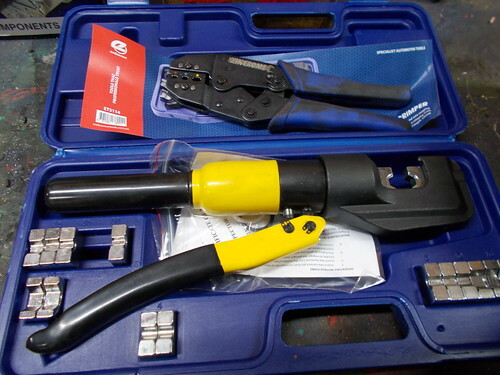 The picture below shows some of the crimping tools I have used and there size. 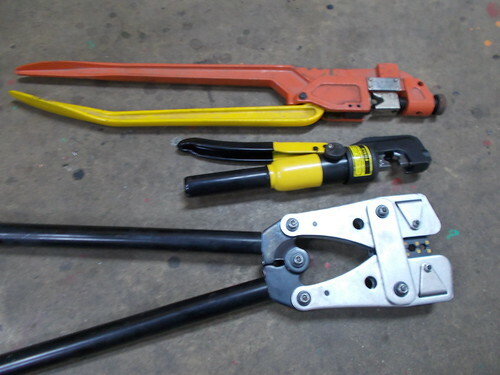 The yellow and orange long arm crimper is very adjustable, and does a good joint, but is bulky and the finish of the crimp is poor from a stand point of looks. The black long arm crimper is bulky too and much harder to use, but gives a better looking joint. it is shown with the same No 35 crimping die in place as the hydraulic crimper. The smaller hydraulic crimper has very easy to change magnetic dies of a very large range. It cost me $75 dollars is moderately hard to use and will give excellent crimps and if carefully used good looking crimps too. The hydraulic crimper I have also made my own dies for so I can cold press rivets of old vehicle sheet metal work. Picture below shows my normal cheapie run of the mill 2 to 5 mm wire crimper with the hydraulic crimper. I these days have the two smaller hydraulic crimpers, one in the workshop and one in the work van. I also have one huge hydraulic one purchased recently for $135 dollars which looks it will handle the cable used on domestic street power poles......will never most likely never use it. Heres a tip, if you have difficulty getting all the strands into a crimp lug put a cable tie around & cut it away as you push it home, especially useful using a plain lug rather than the bell mouth lug shown. Otherwise its easy to end up with a few strands hanging out like the bottom picture. Pfft. I think you are all wrong. THIS is clearly the way to join wires. Note the extra reinforcing structural wire twists for added durability. I overhauled a dual battery system in someone else's vehicle as a favour a while ago. The main feed to the second battery (in the tray) involved three individual pieces of random, miss-matched (small gauge) wire series-joined together and this little beauty hidden under a few wraps of electrical tape in the engine bay... Owner was really resistant to "wasting" a length of 16mm2 double-insulated wire I had on hand and using "new-fangled" crimp connections and glue-lined heat-shrink for end-connections. Wanted to solder it properly, like he did last time... And reuse the old wire. To this day he reckons I "overkilled" it and what was there was fine and not contributing to his fridge-running issues at all..